Here is a page from my notebook. It is where I worked out the stitch pattern for the socks I am knitting with the techniques I learned in Cookie’s class. The stitch pattern is similar to the ‘glynis’ stitch in that it is lace and the same dimensions of 12 stitches by 8 rows. 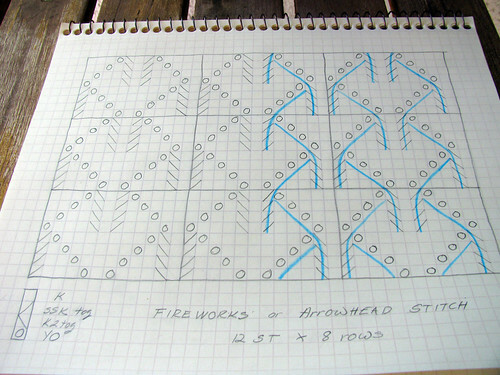 It is also a 4 row repeat that is offset by 6 or half of the stitches for the last 4 rows. I can use the same number of stitches, rows, and needles as I did on the ‘glynis’ socks. The thing I want to point out in the photo is that Cookie recommended drawing out more than one repeat and then drawing in the main design lines. As you can see on the left the pattern looks nothing like the resulting knit fabric. The blue lines show more of the design. They follow the stitches that form a line and are on top of the fabric face. I think this is a wonderful technique to understand how one stitch flows into the next. I will do this again. It really helped me understand what I was knitting, rather than just counting stitches. I found the stitch on a 4th of July sweater in one of the Sandra magazines. It does remind me of fireworks. Since it is so simple, I thought the stitch should appear in stitch dictionaries. I found it in one of the Harmony guides listed as an arrowhead pattern. I am knitting it top down so it will look more like a shower spray on my socks. Darn it! I just noticed that my key is wrong. The back slash should be SSKtog, and the forward slash, K2tog. It is easy to erase and change my notes. It would be too much work to change my flickr photo. This entry was posted on Thursday, May 7th, 2009 at 3:00 am and is filed under Knitting. Tagged: Knitting. You can feed this entry. You can leave a response, or trackback from your own site. I can see what you mean by drawing in the pattern. It definitely looks differently (and probably more accurate)!